Regulators To Ease Restrictions On Drones, Clearing The Way For More Commercial Uses Federal regulations haven't kept up with technology, say drone operators and enthusiasts. Now the Department of Transportation is proposing to allow drones to fly over cities and at night. Federal regulators have announced plans to allow drone operators to fly their unmanned aerial vehicles over populated areas and at night. 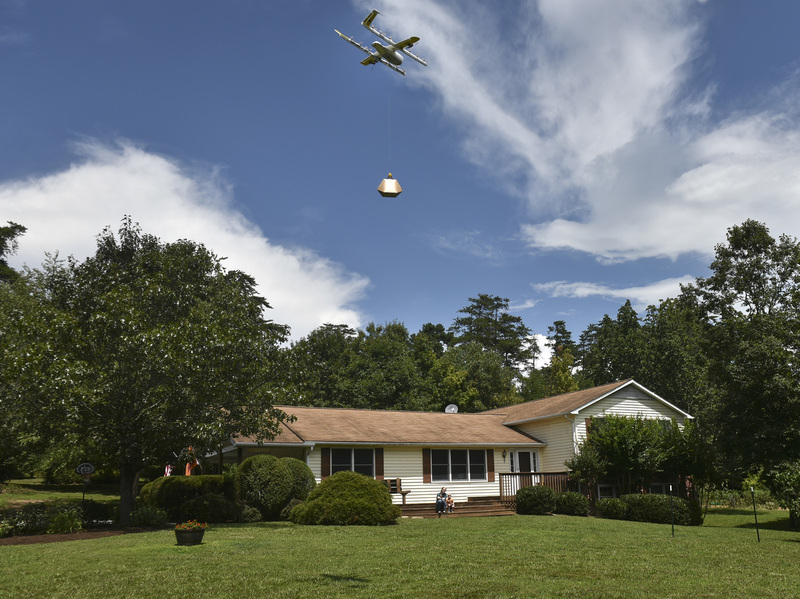 A Wing Hummingbird drone from Project Wing arrives and sets down its package at a delivery location in Blacksburg, Va., last year. Package delivery by drone is one small step closer to reality today. Federal regulators announced plans Monday to change rules to allow drone operators to fly their unmanned aerial vehicles over populated areas and at night, without having to get special permits. Many drone operators and enthusiasts complain that federal regulations haven't kept pace with the technology, arguing that prohibitions on flying drones over people and at night are out of date. "This will help communities reap the considerable economic benefits of this growing industry and help our country remain a global technology leader," said Chao in a speech at a major transportation conference in Washington, D.C., Monday. The changes could allow for drones to to be used to survey construction sites and to deliver critical medical supplies to first responders, among other uses. The use of drones by both hobbyists and for commercial purposes has been, well, soaring over the last couple of years. Chao says that by mid-December, the FAA had registered nearly 1.3 million drones nationwide and had registered more than 116,000 drone operators. Alphabet, Inc., the parent company of Google, and Amazon.com, Inc., are two of a growing number of companies working to develop prototypes and related infrastructure in hopes of making package delivery by drone a reality. But Chao acknowledges that the rapidly growing drone industry is not without problems and safety concerns. She noted incidents last month in London in which drones sighted buzzing around the airspace near London's Gatwick airport led to the grounding and cancellations of hundreds of commercial airline flights over a three day period, stranding thousands of travelers. Air traffic was also halted into and out of London's larger Heathrow airport for a brief time after drone sightings there. "The department [of Transportation] is keenly aware that there are legitimate public concerns about drones concerning safety, security and privacy," she said, adding, "and recent events overseas have underscored these concerns about the potential of drones to disrupt aviation and the national airspace." Chao says regulators are developing and drafting regulations to address such incursions, as well as to protect against national security threats and invasions of privacy from drones. It will still be some time before the proposals lifting restrictions on flying drone at night and over people will take effect. The new rules must be first published in the federal registry, which may not happen until after the partial government shutdown ends. That publication would then kick off a 60 public comment period for those wanting to weigh in on the rules. Chao made the comments at the annual meeting of the Transportation Research Board, which is the world's largest gathering of transportation professionals, bringing together an estimated 13,000 leaders, policymakers, administrators, and researchers from government, industry, and academia.